For our wedding anniversary, Kiley and I spent a few restful days in Hermann, MO. It’s a quaint German town in eastern Missouri. We relaxed, we drank, we ate. It was perfect. While there, we stocked up on some amazing smoked knackwurst. So good. Because this week’s Food Matters Project recipe was Whole Cauliflower with Sausage, I decided to use our fresh knackwurst and roast up some cauliflower and local apples. Apples and brats are great together. This is a great one pot or rather a one roasting pan meal. Enjoy the fall flavors! Oh, and check out the original recipe at Food Fascination. Preheat oven to 425F. Add sausage slices to roasting pan. Toss cauliflower, apple slices, and onions with olive oil in medium bowl. Add to roasting pan. 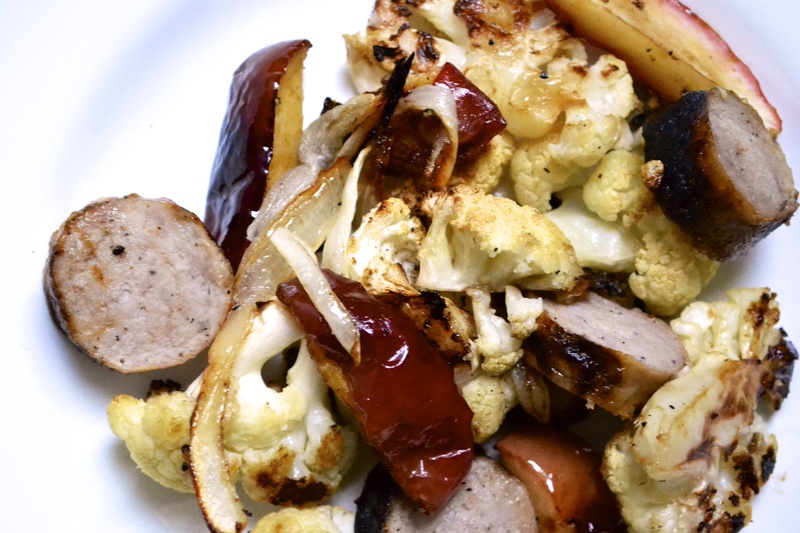 Roast sausages, cauliflower, apples, and onions for 30 to 35 minutes at 425F or until cauliflower is browned and sausages are cooked through. hope you had a great anniversary getaway! i agree that brats + apples are a fantastic combo and the fact that this is a one pot meal makes it even better. My boyfriend has been craving brats nonstop. We think it’s the weather. I have a huge bag of apples in the fridge right now and this sounds like the perfect use for some of them! We went last weekend and we’re going again next weekend! This looks so simple, yet so good!